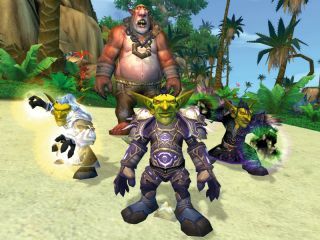 World of Warcraft publisher Activision Blizzard is cutting 600 jobs as the company reacts to rapidly falling subscriber figures. The redundancies will come from the Blizzard wing of the company responsible for the massively-popular MMORPG. The seven year-old title lost 700,000 subscribers in the third quarter of 2011, and another 100,000 in Q4, bringing the global total down to 10.2 million. Subscribers peaked at 12m in 2010. It is thought that EA's recently-released Star Wars: The Old Republic game may be cutting into WoW's market share. Analysts say the majority of the staff cuts will come in the customer service department and the company says the World of Warcraft development team will not be affected. "Constant evaluation of teams and processes is necessary for the long-term health of any business," said Blizzard CEO and co-founder Mike Morhaime. "Over the last several years, we've grown our organization tremendously and made large investments in our infrastructure in order to better serve our global community. He adds, "However, as Blizzard and the industry have evolved we've also had to make some difficult decisions in order to address the changing needs of our company." Schedules for upcoming games will not be affected, the company assures.